During our personal tour of the OceanView Mine in January 2011, we purchased a few segments of Pink Tourmaline from the Stewart Lithia Mine, 2 Triphane (Yellow Spodumene) Crystals from the Pala Chief Mine, 1 Kunzite (Pink/Purple Spodumene) Crystal from the OceanView Mine and one INCREDIBLY beautiful large Kunzite Crystal that showed a wonderful blue purple down the long axis, a teal green ninety degrees to the long axis, and a purple or bluish down the other axis. Both these Kunzites were doubly terminated and were found in the vicinity of the famous Big Kahuna Pocket in late 2010. An email from Stephen confirmed what we had first thought when we first saw the crystal - "that thing is amazing! clearly several stones from that crystal and oriented down the axis will be the way to go but will wait and see after I figure what needs to be removed and mark out the saw cuts etc. 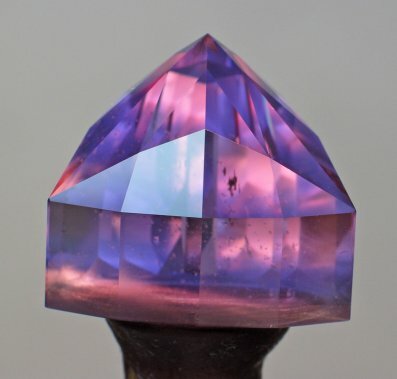 or I can just place it next the other crystals in my collection...."
The photos below take the viewer through the cutting of the first large faceted Kunzite from this crystal. Recent gemstone rough finds in San Diego Co. included the new Spodumenes from theOceanview Mine. During the 2010 mining of the Oceanview Mine, the 'Big Kahuna' Zone was discovered. This was a large pocket with a series of smaller satellite pockets. The zone yield Spodumenes, Quartz, Tourmalines and Beryl. 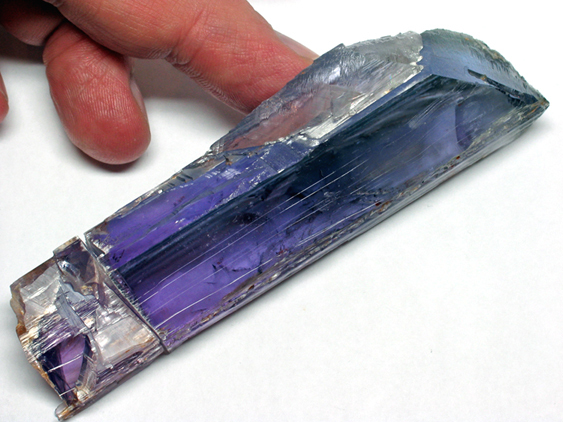 This is one of those crystals discovered in the vicinity of the Big Kahuna Zone, weighing in at 770cts (154 grams). We estimate this piece to measure approximately 4-1/2 inches long. NOTE the color variation from the deep bluish purple on the left and eventually becoming a green or teal on the other end. This photo was taken in the office of All That Glitters when this crystal was initially displayed to the public for sale. Our Award Winning Supreme Master cutter took the other photos below after he received the crystal for study and potential faceting. As one can see in this shot the crystal is turned slightly about 45 degrees and the greenish axis can no longer be seen. 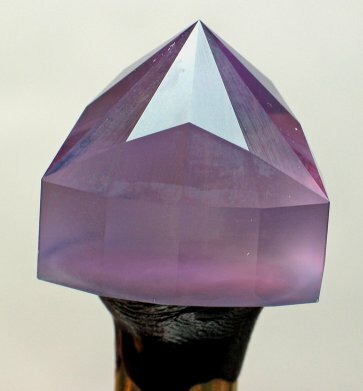 Just a slightly different angle can cause the color of this crystal to change as the axes being viewed changes. In this photo, you can see a bluish component. When looking down the C axis (the long axis), the color was so deep a flashlight was necessary to see the color. It was a very deep bluish purple. Rotating it slightly produced a bluish color, and rotating more produced a green. The crystal also changed color down the axis to the green shown in the other photos. Stephen has sliced off the left hand end which had some issues. There is a smaller gemstone to be had here, after careful trimming and orientation. There is an actual clear etched section on top of the crystal that is already sawn off but in place to show its original location. The clear etched piece was not as readily removed as one had hoped and actually had to be sawn off. 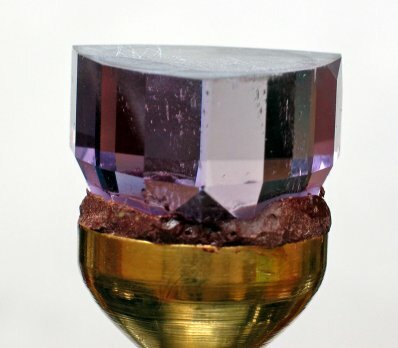 At this point, the small colored segment removed from the base weighs approximately 83cts, the clear etched piece on the top weighs 38.50cts and the remaining large crystal weighs 602cts. The clear piece is interesting due to the natural etching and is in the possession of our supreme master cutter. Stephen weighed the crystal on his scale prior to any work and it weighed 769.80cts. The total of the 3 pieces is now 723.65cts. Weight loss due to flaking, chipping and 2 saw cuts totals about 46cts - which would be equivalent in weight to a nice sized Kunzite when faceted! Four emstones can be faceted from this piece. Stephen has marked off both ends, to produce two gemstones. 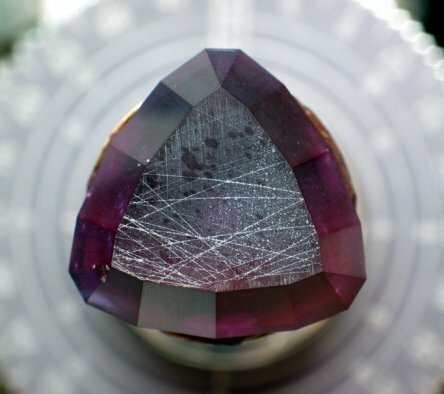 The middle section is not marked off presently, but this will also produce 2 more gemstones. There is a 5th gemstone that will be much smaller, and that is from the original first cut of the crystal, far left hand side and can be seen in previous photos. Same step in the process as described above, but the crystal was rotated and one can now see the predominate green color in this view/direction. 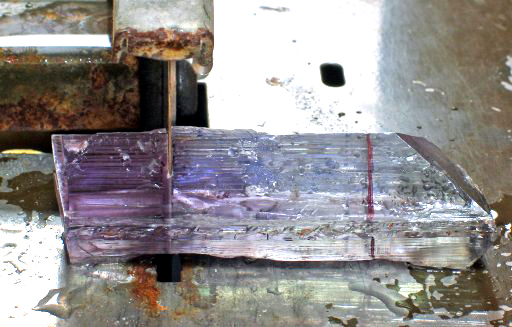 The trim saw blade is almost through the crystal in the first of two cuts being made. The first piece that will be faceted has now been removed from the main part of the crystal. 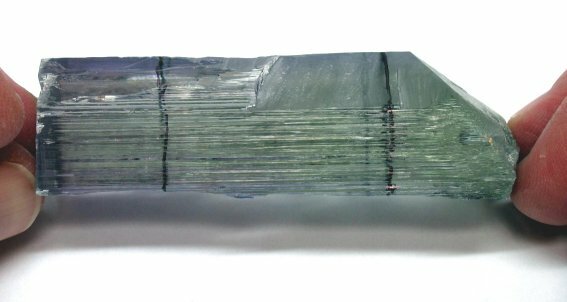 The other termination of the crystal, the green section, has been removed. 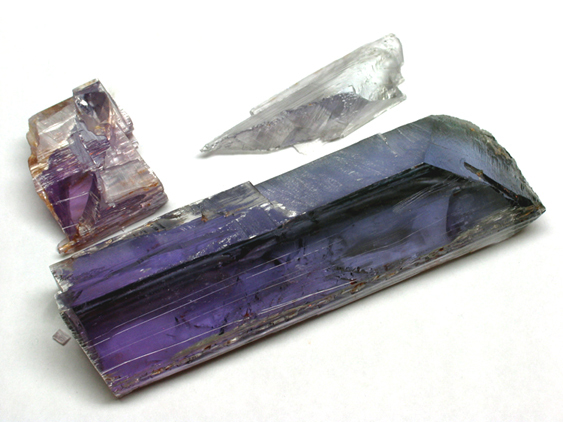 The 'middle' section shown here on the right contains both a purplish color and a greenish color and will need to be split in the future creating two more facet grade pieces. 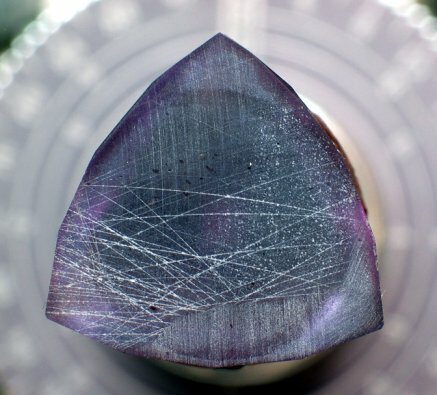 This crystal was unique for a number of reasons - two of those reasons is seen here. 2.) Though the crystal was etched and had the expected striations of a Spodumene crystal, there was a very smooth almost polished looking surface on one of the sides, which was natural. Here, you are looking at that smooth natural surface with the weights of each piece that was just trimmed. 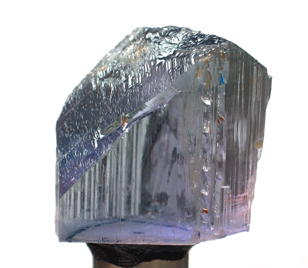 Similar to the above photo but the crystal has been rotated about 90 degrees from the position above. You can clearly see more green in this direction. Again, the crystal has been rotated another 90 degrees. You can see the color shading from purplish to green, and the natural striations are very present. The three segments weigh a total of 593.15cts approximately. With these two trim saw cuts, there was an associated weight loss of approximately 9cts. Looking down the C axis, down the length of the crystal. The view that you see will become the tables of these future gemstones. Looking down the C axis again, but from the opposite direction. If one were to rotate the segment on the right hand side, one would see the green color observed in some of the photos above! This is the left most segment one sees in the above photo. 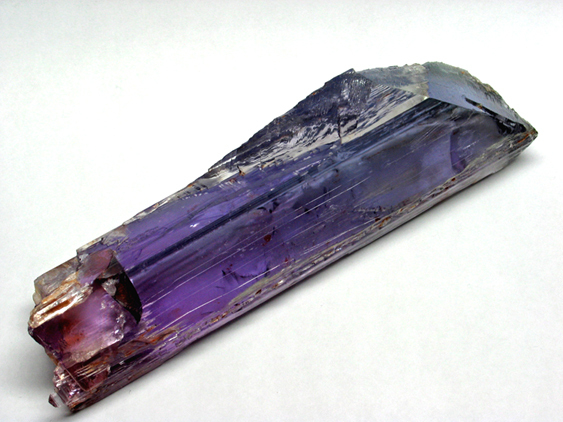 It is the left most segment of the main crystal after the first smaller segment was trimmed from the left side of the crystal and placed aside for future cutting. 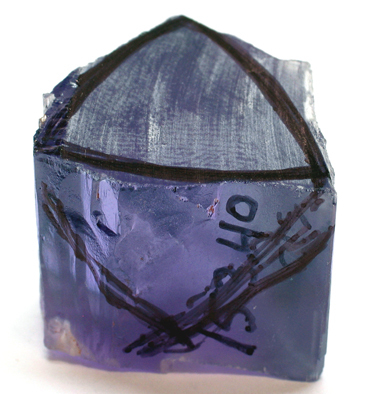 Cutter has roughly sketched the shape of the future gemstone - a trilliant. 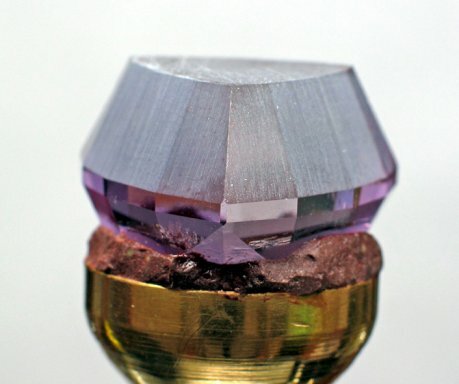 Both a top and side view of the piece selected for faceting. Cutter has sketched the pavilion (bottom) on to the side of the rough. Note that the rough weighs 153.40cts. 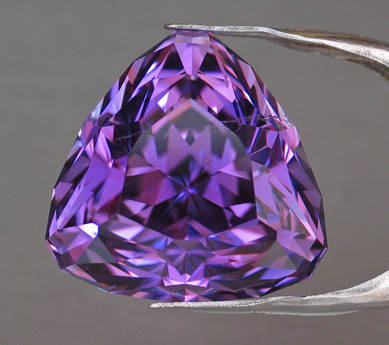 Most people do not realize that a properly faceted gemstone will typically yield ONLY 20% of the original weight. That means that 568px of the rough is lost to cutting as it is ground away. We are expecting perhaps a slightly larger yield because the shape of the rough is roughly a trilliant. If we do indeed get a 20% yield, we would expect about a 31ct gemstone. The bottom has been finished at 500 diamond grit and the girdle was done with 180 diamond grit at this point. Every facet must go through the same sequence of various diamond grits, starting from coarsest grit and going to the finest. In the case of faceting this Kunzite, the laps used consisted of 180, 500, 8000 (pre-polish) and 200,000 diamond grit (final polish). 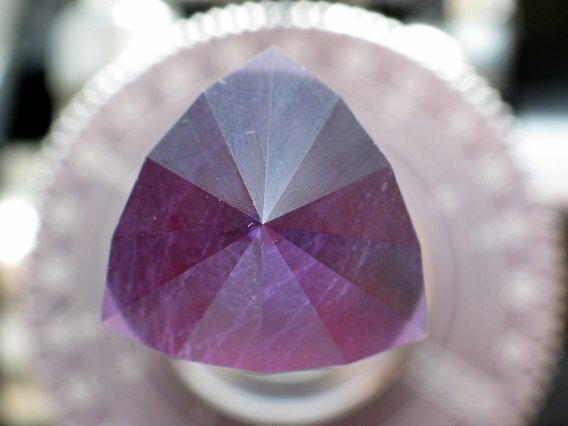 A shot looking down on the bottom and culet/point of the gemstone - the fine 500 grit cutting lap was used after the 180 grit lap to smooth this side before the girdle/side facets were cut in with 180 coarse diamond as shown in the previous photo. The 500 grit diamond lap was used to finish the girdle side and then the pavilion girdle brake row was cut in with this lap giving the stone the same fine finish over all of the facets just before moving on to 8k diamond pre-polish. Here we see Stephen has pre-polished the entire bottom of the stone with 8k diamond and also added the last six main facets, two of which can be seen off the corner and look like elongated kite shapes in this photo. The bottom has been completed and will not be touched again unless problems arise, and that is very possible when working with Spodumene. The final polish is 200k diamond. 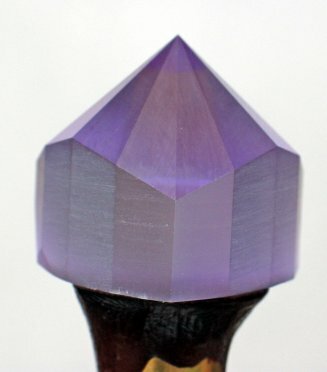 The gemstone has been transferred to a different dop so that the crown/table can be faceted. Looking down on what will become the table and crown. One can see scratches from previous diamond grits used to create a flat surface where the dop was attached when starting to work on the bottom. These scratches will be removed during the next steps. Fraying at facet junctions due to cleavage. This issue was encountered at two of the three corners. Issue encountered above is seen on another corner. Issue/problem continues as the crown is continued. Third corner has no issues and it is not in a cleavage plane. Though no problems on this corner, that extra facet noted above must now be cut into this corner! View of the table and crown. The new corners have been cut in to remove the fraying that was previously encountered. 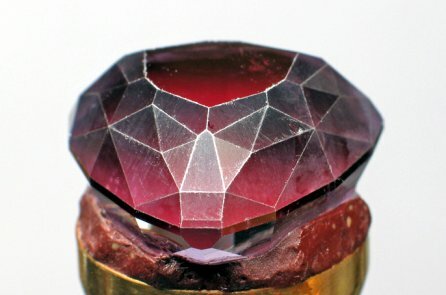 Note the color change of the gemstone for a few reasons - you are looking down another axis now, there is red dopping wax on the bottom and one can no longer see through the gemstone. 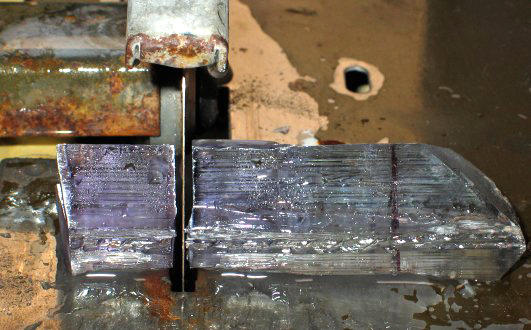 The beginning of a new cutting sequence, all of which are being cut in with the fine 500 grit diamond lap. 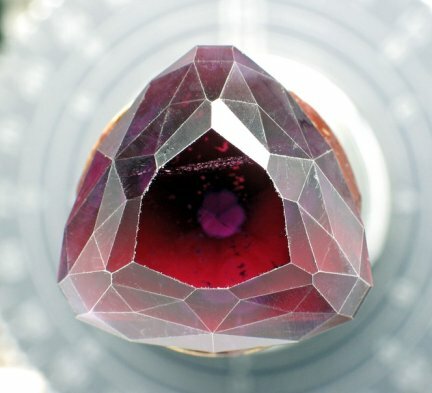 One sees facets take shape only to be removed to some extent in the next step, leaving behind differently shaped facets that begin to take the form of the finished facets. Further along on the crown and the diamond grit has gotten finer, you can see that added facet that is currently in the shape of a teardrop. Similar view to the above. 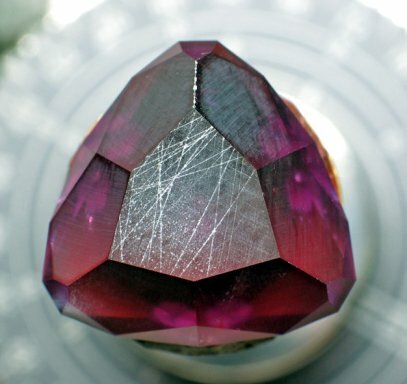 Gemstone has been rotated about 45 degrees from the position above. 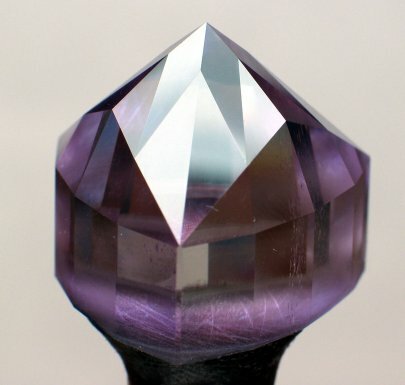 A veil can be seen in the gemstone at this point, but will be hidden by brilliance when completed and shouldn't detract from the finished gemstone when completed. Continuing with even finer 8,000 diamond grit obtaining a perfect pre-polish by removing all issues and creating a near mirror-like surface on each facet just before the final polish of 200k diamond. Table has been completed and finished with an amazing fine 200k diamond grit! Many cutters may follow up with a final polish of 50k diamond, but Stephen has been using 100k which we felt provided a superior finish/polish compared to most other cutters. With the 200k diamond, it doesn't get ANY better! Thanks go out to our Award WInning Supreme Master Gemcutter, Stephen Kotlowski, G.G., CSMG, for the photos provided during the steps above, his expertise in faceting and communication. Photographed under 65K Natural Daylight/Full Spectrum Lumichrome light. 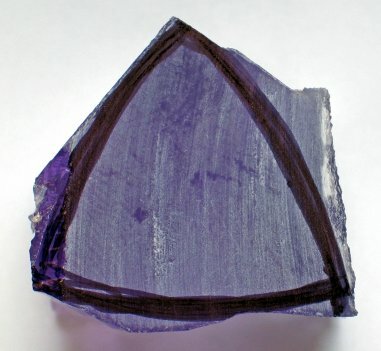 One can see more purple with blue highlights. Under diffused home lighting (natural) as well as by a window (indirect sunlight), the body color is more purple with blue highlights. This Kunzite tends to be more pink under office fluorescent lights and incandescent lights. It all depends on what wavelengths are available in the light source. The above steps show a successful gemstone being faceted, but there is no guarantee of success. 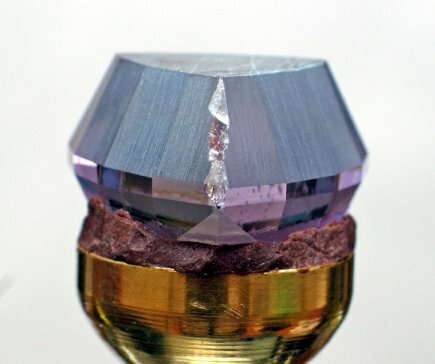 In fact, the very next piece of rough from the crystal above to be placed into the faceting process, cleaved and exploded. 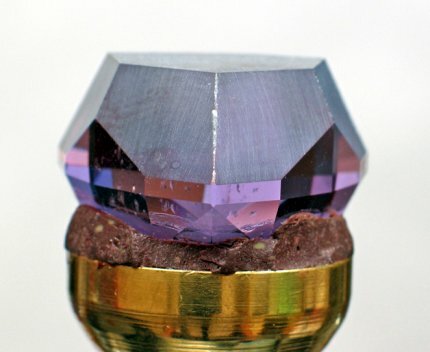 Faceting frequently does not go exactly as planned, and that is very often the case when faceting gemstones from the rough. 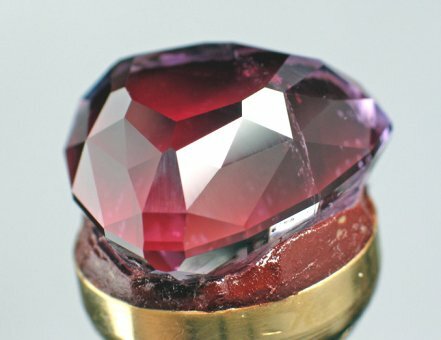 So many issues can arise that make the gemstone smaller, or one finds inclusions that one didn't see prior to purchasing the rough; the gemstone can be overly dark and though saleable for most businesses, this wouldn't be a gemstone for All That Glitters. Also, there are times, and sometimes more frequently than desired, things go terribly wrong. 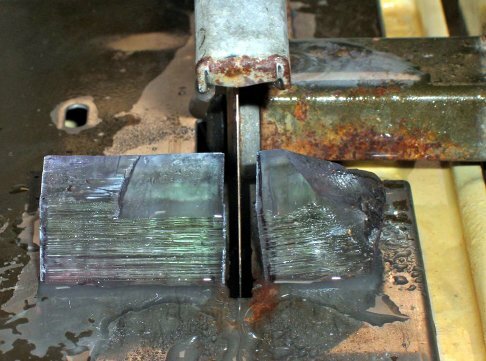 This can happen with Tourmaline whose crystals are frequently under stress, and they will crack or break. 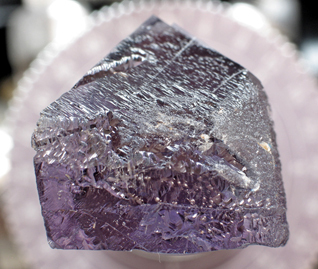 With Spodumene (Kunzite and other varieties) and DIaspore, issues are more the norm. It would be uncommon NOT to have something that must be tweaked, modified, etc. 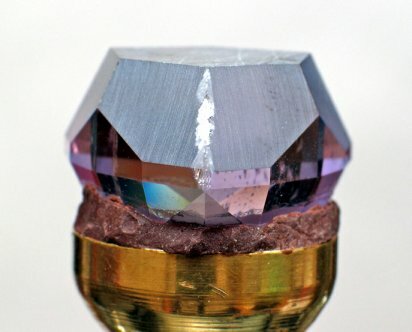 In the case of faceting the second piece of the crystal above, the very tip/termination which was green, teal and purple, a catastrophe occurred. The photos say it all - see below. A wonderful 161ct piece of rough, which should have yielded a 32ct (at minimum!) or so gem, may be an entire loss. 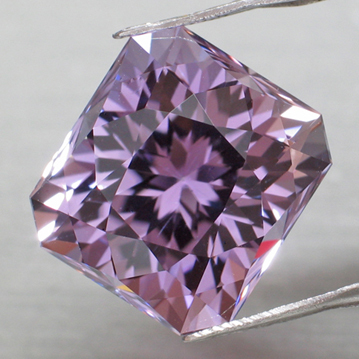 The first gemstone was faceted successfully. This second one could be an entire loss, with estimates of at least $6000 or more from what we expected to yield in the end. What will the other 3 pieces produce? Will they produce?? 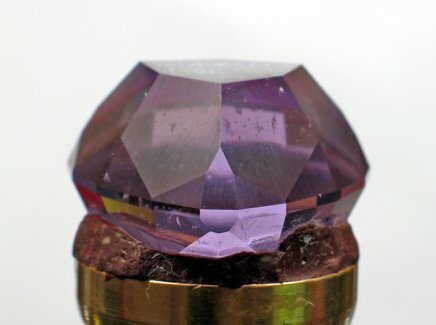 The public and trade rarely hears of the risk that one takes when faceting gemstones (or even refaceting). 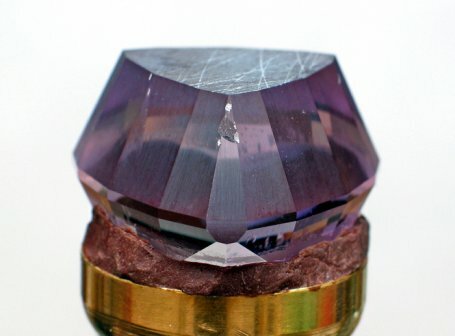 When it comes to Spodumene and Diaspore, even the experts cannot insure what will happen when trimming, sawing and faceting begins. This is frequently taken into consideration in pricing these gemstones. We did manage to save the largest section seen in the above photo to facet a 16.01ct gemstone. This represents a yield of only 10% as the original piece of rough was just over 160cts, making this a loss of 144cts. (Rule of thumb is typically a 20% yield from rough and that can be lower due to issues or higher if the shape of the rough is similar to the cutting design - it can be considered a big gamble faceting a gemstone from the rough.) 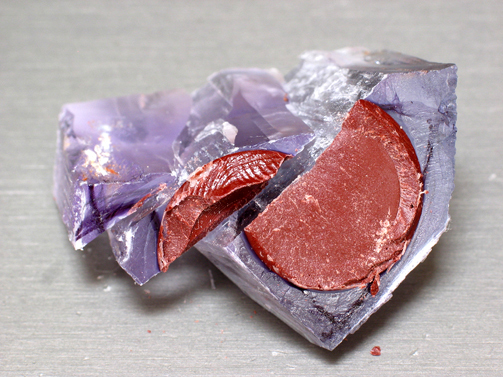 See the finished gemstone below. A 16.01ct Natural Kunzite from the Oceanview Mine in California, faceted by our Award Winning Supreme Master Gemcutter. The color is light bluish lavender to a pink ice color depending on what wavelengths are available. The cutting style is a one of a kind creation, with a portuguese bottom and modified double barion top, measuring approximately 13.78 x 12.49 x 11.65mm. (UK-Portuguese Barion rectangle) (ovml-12-03b) $135/ct (This is a steal considering the size and the cutting; an INCREDIBLE SPARKLER.